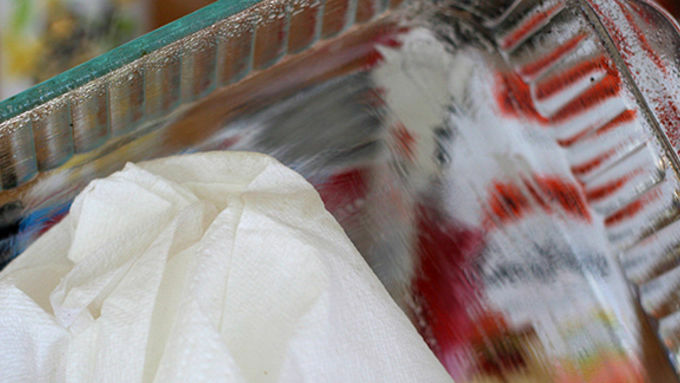 Lightly coat an 8- or 9-inch square dish with cooking spray, and then using a paper towel, wipe out the dish. It will leave a light residue to help unmold your shots, but it won't affect the taste. For red layer, sprinkle half of a packet of gelatin over 1/4 cup of water. Allow it to soak in a minute or two. Add one box of the cherry gelatin, along with 1 cup boiling water. Stir until everything has dissolved. Add 3/4 cup of vodka. Repeat the same process to make the green layer. To make the white layer, sprinkle two packets of gelatin over 1/2 cup of water. Allow it to soak in a minute or two. 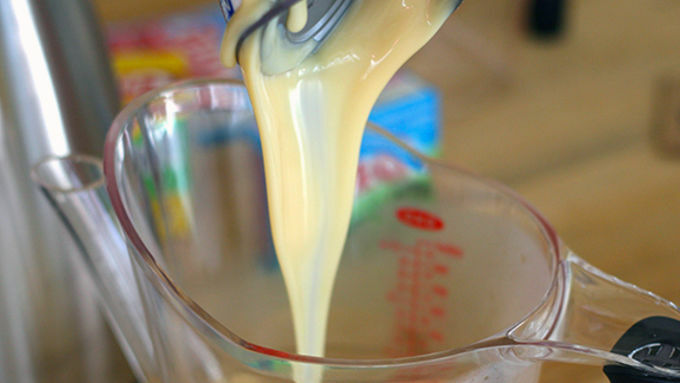 Pour in 1 cup of boiling water and one 14-ounce can of sweetened condensed milk. 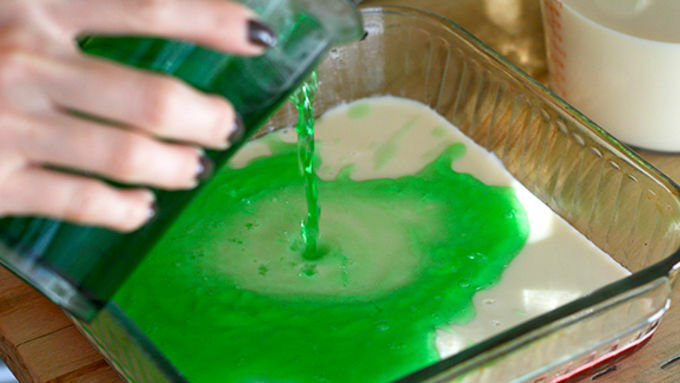 Stir until everything is thoroughly mixed and gelatin is dissolved. You'll have approximately 3 cups of liquid. Allow to cool to room temperature. When you're ready to serve, gently pull the edges away from the pan, and invert onto a cutting board. Slice into even squares. (Alternately, you can just cut in the pan itself, but it might be harder to remove the first few squares). So you’re hosting a holiday party. You want everyone to have a good time. You want to make something festive. You don’t want anything too complicated. 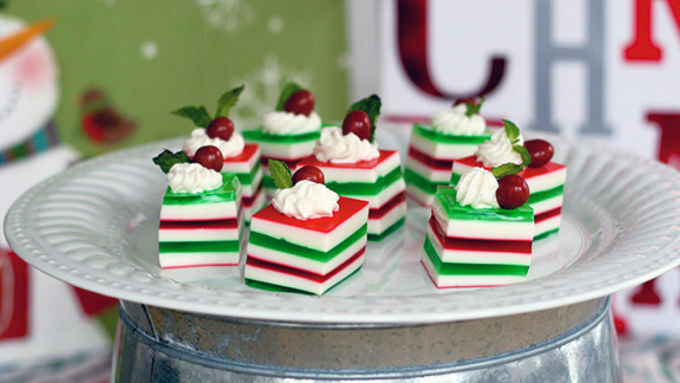 Enter…Holly Jolly Jelly Shots! C’mon. 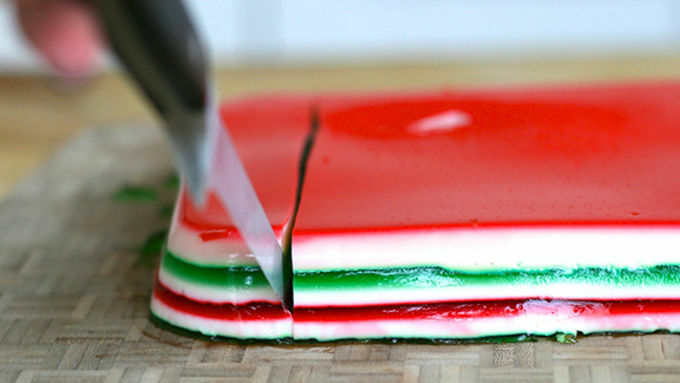 It’s just not the holidays without red and green spiked gelatin. 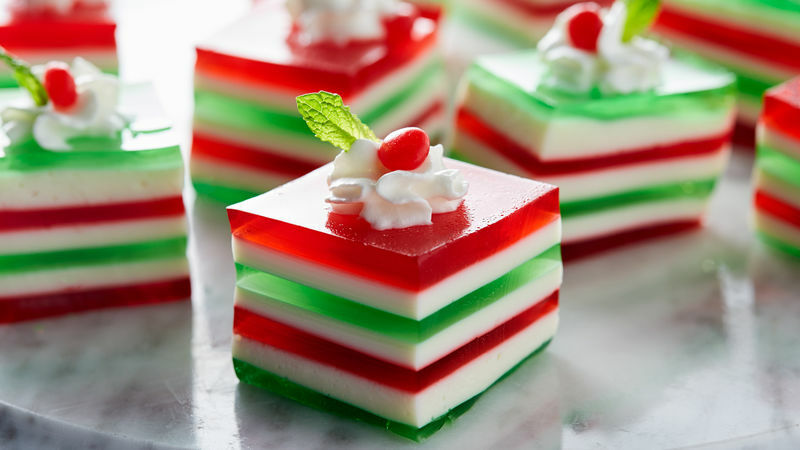 To make these, you’ll need a box of cherry (red) gelatin dessert, a box of lime (green) gelatin dessert, and a white gelatin layer, made with a mixture of sweetened condensed milk and plain unflavored gelatin. Oh, and vodka. Duh. 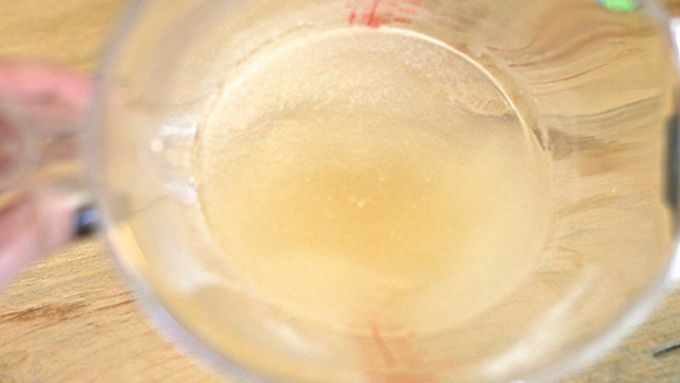 (Though, you can easily make these non-alcoholic for the kids. Just sub water where it calls for booze). You’ll also want to grab any sort of measuring cup that you own (preferably ones with pour spouts). Now, listen up! It’s VERY important that your white layer has cooled to room temperature. Otherwise, you will melt the red layer. See that pinkish-red coating? Yeah, that’s what happens when you don’t wait. In retrospect, it made for an interesting and pretty color, so if you want a “creamier” look, simply mix a little of your white layer with the red and green. Otherwise, do as I say, not as I do if you want clearly defined layers. During the process, I left everything out at room temperature and it was totally fine. If your mixtures start to solidify at all (particularly the white), just pop it in the microwave for a couple seconds, stir and allow to return to room temperature. Top with a small mint leaf and a red candy to simulate a holly leaf. (Note on the candy: I really, really wanted red hots, but couldn’t find any for the life of me. Instead, I used Boston baked beans, but I think red Skittles would work too). Happy Holidays!